The deadline for nominations for the 32nd Annual GRC Awards has been extended to Friday, July 12. The Geothermal Resources Council (GRC) has announced that the deadline for nominations for this year’s GRC Awards has been extended to Friday, July 12. The awards recognize distinguished colleagues in the geothermal community from around the world and have been a highlight of the geothermal calendar since the late 1970’s. The winners will honored at the GRC Awards Luncheon, the climax to the GRC Annual Meeting being held at the MGM Grand, Las Vegas, Nevada, USA from September 29 –October 2. The theme for this year’s meeting is Geothermal: A Global Resource, from Larderello to Las Vegas. “The recipients of these awards often have a lifetime of achievement in the geothermal academic, scientific and commercial communities”, said GRC interim Executive Director Steve Ponder. “The GRC Awards recognizes the contributions of these individuals to the geothermal sector”. More information on the GRC Awards, including a nomination form (PDF), can be found on the GRC website. The deadline for nominations is Friday, July 12. Congratulations to the University of Rochester for winning the 2013 Geothermal Student Competition! The final four Semi-Finalists pitched their plans to develop a geothermal enterprise in their home state/region to a panel of geothermal experts drawn from the private and public sector yesterday at the U.S. GEA National Geothermal Summit in Reno, Nevada. The scores and order of placement below reflects the combined totals of the business plan grade and the presentation grade. 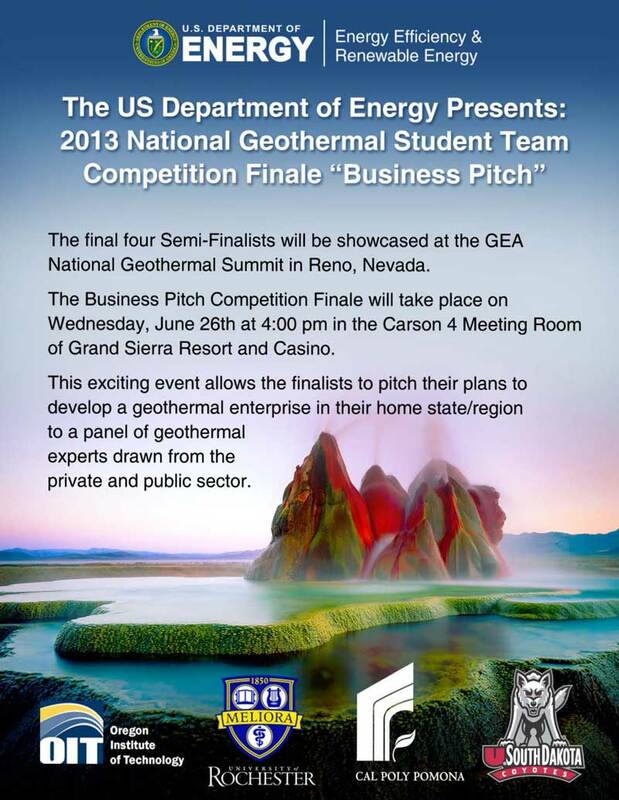 The final four Semi-Finalists are being showcased at the U.S. GEA National Geothermal Summit in Reno, Nevada. This exciting event allows the finalists to pitch their plans to develop a geothermal enterprise in their home state/region to a panel of geothermal experts drawn from the private and public sector. President Obama, declaring that “Americans across the country are already paying the price of inaction” on climate change, on Tuesday announced sweeping measures to reduce greenhouse gas pollution and prepare the nation for a future of damaging weather aggravated by rising temperatures. Embracing an issue that could define his legacy but also ignite new battles with Republicans, Mr. Obama said he would use his executive powers to require reductions in the amount of carbon dioxide emitted by the nation’s power plants. That was the centerpiece of a three-part plan that includes new federal spending to advance renewable energy technology, as well as spending to protect cities and states from the ravages of storms and droughts that are exacerbated by a changing climate. A new study was released today by the American Council On Renewable Energy (ACORE), California Clean Energy Fund (CalCEF), and Climate Policy Initiative at the Renewable Energy Finance Forum-Wall Street where hundreds of leaders from the renewable energy industry convened to discuss the current state of renewable energy finance. The study titled "Strategies to Scale-Up U.S. Renewable Energy Investment" (PDF) highlights the role of policy at the state, federal, and regulatory level in unlocking record levels of private capital in the industry during the past decade. The paper also explores policies that would significantly increase private capital into renewable energy development. Two foreign companies from Japan and Iceland have shown interest to invest in Tanzania’s geothermal power generation. Minister for Energy and Minerals, Professor Sospeter Muhongo stated that Tanzania has a total of 15 areas which are potential for geothermal production. “But, according to the geological survey, three areas have shown to have enough stock of steam ranging from 220 to 250 degrees centigrade, which is the temperature required for power production,” he said, citing Lake Ngozi in Mbeya where the first geothermal power project is expected to start before the end of this year. Muhongo however failed to disclose names of the companies from Japan and Iceland which are to carry out power generation activities in the area. Power in the Imperial Irrigation District, in the Imperial Valley , Southern California, is likely to come partly from a local geothermal plant in the near future, increasing IID’s renewable energy portfolio by as much as 3 percent. IID Board of Directors could approve today a power sales agreement with Southern California Public Power Authority to get geothermal energy from the Ormat Heber 1 power plant. If approved by the board, the district would receive about 15 MWe of geothermal power from December 2015 to December 2018, a report to the board notes, and 10 MWe from January 2019 to December 2025. The agreement worth about $7.4 million will increase IID’s renewable energy portfolio as California requires electric utilities to obtain 33 percent of their power supplies from renewable wind, solar or geothermal sources. Geodynamics Limited has provided an update on the 1 MWe Habanero Pilot Plant trial being conducted near Innamincka in South Australia. Turbine test run - Initial steam generation and turbine runs have been successful. Following some minor adjustments, the Distributed Control System has been functioning well, integrating the brine loop and steam loop to establish stable plant operations. Brine reinjection loop reliability and performance testing - Key areas monitored include the performance of the reinjection pump and seal. The closed loop performance over the first month has been in line with expectations with closed loop system flows achieved in line with modelled predictions. Initiation of tracer testing - A tracer test has been initiated to measure reservoir size and other characteristics. Results of the test are expected over the coming months as the brine passes through the reservoir. GRC Member company U.S. Geothermal Inc. announced today that its wholly owned subsidiary, U.S. Geothermal Guatemala, S.A., completed drilling well EC-1 at the El Ceibillo Project. Well EC-1 was drilled to a total depth of 4,829 feet (1,472 meters) and encountered a bottomhole temperature of 491°F (255°C), with the temperature gradient at the bottom of the hole rising at a rate of 7.1°F/100 Feet (129.1°C/km). High temperatures in excess of 392°F (>200°C) were encountered in the well beginning at a depth of 2,625 feet (800 meters), which represents a potential high temperature reservoir interval in excess of 2,204 feet (672 meters). Permeability was encountered and a slotted liner capable of supporting production was placed in the well. A preliminary cleanout flow from the well looked favorable and warrants formal testing. Flow test equipment is currently being fabricated for a planned test, which is expected to be performed within the next 4 to 6 weeks. Biliran Geothermal Inc. (BGI), is scheduled to drill an exploratory well in the third quarter to assess the availability of resource within its geothermal field on Biliran island, an official of the Philippines Energy department told reporters yesterday. Data from the Energy department showed that the Biliran geothermal concession -- which was awarded to BGI in July 2008 -- covers an area of 260 square kilometers in barangays Cabibihan and Villa Vicenta in the municipality of Caibiran. It was estimated to have a potential geothermal resource that can support a 50 MWe power plant. BGI is a joint venture between Filtech Energy Drilling Corp. (FEDCO) and Iceland-based Orka Energy Holding ehf. are due this Friday, June 26. The Geothermal Resources Council (GRC) reminds the global geothermal community that nominations for this year’s GRC Awards are due this Friday, June 26. More information on the GRC Awards, including a nomination form (PDF), can be found on the GRC website. The deadline for nominations is June 28, 2013. Supreme Energy received approval from the Rajabasa Indigenous People, Lampung, to conduct exploration and exploitation of geothermal energy in the protected forest areas of Mount Rajabasa South Lampung Regency. As reported earlier, the Supreme Energy activities had been halted because of Rajabasa Indigenous People rejected the geothermal plant's activities. They assumed exploration and exploitation will kill their livelihoods and damage the environment. "The foot print of the geothermal exploitation does not give any bad effect to the environment such as coal mines or oil palm plantations," said Triharyo Indrawan Susilo, President of Supreme Energy, Friday (6/21). He added the company will replace the land area with two-time larger area that has been used for the exploration. If the company is using the forest areas and cut down a 15 acres land full of trees, then the company will plant trees at a 30 hectare-land area. In North America alone, there is enough energy trapped beneath the Earth's surface to produce 10 times as much electricity as coal currently does. Geothermal power is clean, ubiquitous and reliable. And the technology to harness it is finally ready for primetime. What about geothermal? I have to admit I don’t have a quick answer for that one. There is no Big Geothermal. They’re not part of the racket – yet. But it always does get me wondering: What is the deal with geothermal? Is it the jetpack of renewable power, that enticing but forever elusive next big technological thing? The Center of Excellence for Geothermal Energy (CEGE) at the Gujarat-based Pandit Deendayal Petroleum University (PDPU), an industry-government initiative to create a talent pool for the energy field, has completed pre-feasibility studies in geothermal energy, becoming the only university in India to foray into this renewable energy sector with State funds. “We have so far conducted pre-feasibility studies for the entire State of Gujarat with the help of geological, geochemical and remote-sensing technologies and have identified five geothermal provinces. Further, geophysical subsurface investigations are ongoing to understand geothermal potential and release target locations for geothermal well drilling,” said B.K. Behera, professor at the Geothermal Energy unit of the university. Uganda has an estimated 400 MWe of untapped geothermal energy, mostly in the western region, a survey by KenGen, a Kenyan geothermal energy production company, has shown. With the uncertainty surrounding the River Nile, Uganda would be better off exploiting its geothermal energy as an alternative in case of any energy production interruptions, experts advise. An international workshop on geothermal energy development to be held in Taipei is expected to explore the latest advances in the field and the alternative energy’s commercial viability, the event’s organizer said yesterday. The APEC Workshop on Geothermal Energy Development has invited experts and industry heavyweights from the US, Japan and New Zealand to discuss the green energy’s future trends and development, said Digitimes Research, which is organizing the event. Douglas Hollett, director of the Geothermal Technologies Office at the US Department of Energy; Noriyoshi Tsuchiya, a professor at Japan’s Tohoku University; and Brian Carey, department head of Geothermal Sciences at the New Zealand-based GNS Science, are to speak at the forum. Geothermal energy is a renewable energy with many advantages; it is base load, local, flexible and environmentally friendly. Investors should be encouraged to take part in its promising development. Despite this, its penetration into the energy market remains difficult. Although profits can easily be made, investors consider the geothermal resource as risky and are therefore reluctant to commit to projects. The geological risk is a common issue all over Europe, the GEOELEC project calls for the establishment of a Geothermal Risk Insurance Fund at the EU level and, to this end, publishes today a report outlining such a scheme. Kalahari Geo Energy Limited plans to commence preliminary shallow drilling for geothermal energy development at its identified sites in the Kafue basin. The company signed a memorandum of understanding with the Zambian government in 2011 for geothermal energy exploration rights to "certain identified targets among them in Kafue basin" but delays to get environmental approval delayed commencement of the exploration works. "After delays, we finally got the Environmental Impact Assessment (EIA) approval last year and in the next two weeks, we are looking at commencing shallow drilling. We will drill wells of 350 meters deep and depending on the results, we may do deep drilling in September," Moses Banda, company director, said on the sidelines of a mining conference in Lusaka on Wednesday. "If the results from the deep drilling are satisfactory, we may start the plant design in the first quarter of next year and possibly commence power generation in 2015." plug the two others. Map courtesy DLNR. The Hawaiian state Legislature has earmarked $2.5 million to plug and abandon two 20-year-old research wells that were part of a program to determine the extent of geothermal resources in lower Puna. The Hawaiian Scientific Observation Hole Program consisted of three wells drilled in in the early 1990s to obtain cores from Kilauea volcano’s east rift zone. 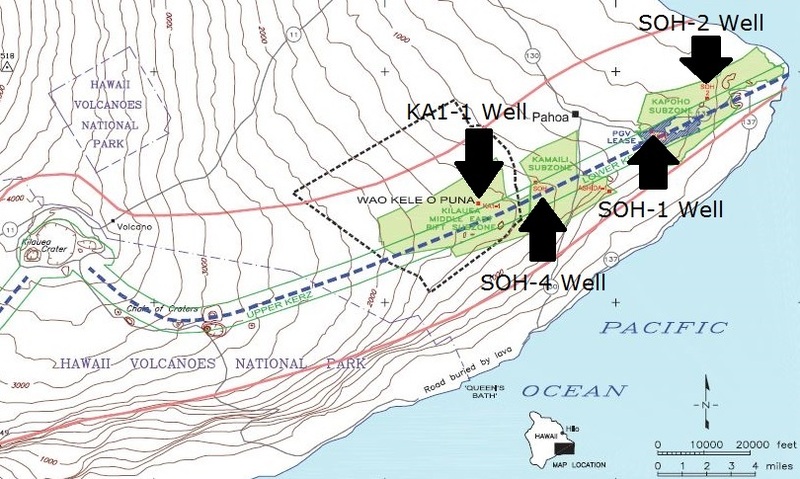 One of the two wells to be plugged, SOH-1, is located on land in Pohoiki leased by Puna Geothermal Venture, the state’s only active geothermal energy plant. The other, SOH-2, is located several miles to the northeast towards Kapoho. The cooperative project, titled "Deep Roots of Geothermal Systems" (DRG), is managed within the cluster cooperation of GEOthermal Research Group (GEORG) and is financially supported by GEORG, Orkustofnun, Reykjavik Energy, HS Orka, Landsvirkjun and the Iceland Deep Drilling Project (IDDP). The aim of the project is to understand the relationship of water and magma in the roots of volcanoes and how heat is transferred into geothermal systems to maintain their energy. Furthermore, the design of wells and well heads for high temperatures will be a focus of the project, as will methods for utilizing superheated steam from greater depths. View videos and download presentations from the seminar series. Kirsten Marcia remains confident that the Estevan area will be home to Canada’s first geothermal power plant. A former Estevan resident, Marcia is the CEO of DEEP Earth Energy Production. Their objective is to drill into heat resources at least three kilometres below the earth’s surface. An engineering and design study is scheduled to happen late this year, and Marcia said construction would begin next year. Power generation would follow in 2015. It would be a demonstration project that would produce five MWe, allow them to understand the resource and plan for the future build-out. “We're very optimistic that the resource is so vast that it could ultimately produce several hundred megawatts of power,” said Marica. Geothermal Power Tanzania Ltd. plans to invest as much as $350 million to drill steam fields in the country’s south and build its first geothermal plants with the capacity to generate up to 140 MWe by 2018. The company began drilling two wells in Tanzania’s southwestern Mbeya region this year and found there’s potential to create power from steam within at least two systems in the area, Chairman Graeme Robertson said in an interview today. Geothermal Power, which has six prospecting licenses in Tanzania, may initially install a wellhead generator to provide 2 MWe by the middle of next year. So-called wellhead generators produce power once steam fields are ready, much quicker than awaiting construction of full-fledged plants. The company then plans to deploy generations units capable of producing 5 to 10 MWe within two years and eventually 25 MWe units, Robertson said. “The actual potential will depended on the flow rates,” he said. Geothermal Power is exploring options to raise funds including approaching development lenders such as the World Bank and African Development Bank, Robertson said. Geothermal Power Tanzania Ltd. is 70 percent owned and managed by Mauritius-based Geothermal Power Ltd. The rest is held by Tanzania’s National Development Corp. and Interstate Mining & Minerals Ltd. in Tanzania, according to its website. Renewable power firm Constellation Energy Corp. (CEC) is planning to tap the steam resources from its 20 MWe geothermal power plant in Oriental Mindoro to grow tilapia, sea bass and shrimps the natural way. New energy player CEC, in partnership with Emerging Power Resource Holdings Inc. (EPRHI) and Dutch company IF Technology, plan to develop the aqua-cultural use of geothermal fluids to grow healthier and tastier fish and shrimps. “There is more to geothermal energy than the production of power. Mother Earth’s bosom can also help us do so much more, including shortening the time needed for growing fish and shrimps the natural way,” said Dutch Dr. Antonie de Wilde, EPRHI Project CEO. CEC-EPRHI-IF Technology consortium has recently started work on the geothermal project in Barangay Montelago, Naujan, Oriental Mindoro, which will also supply hot water to a spa. It has a potential of generating up to 70 MWe and is scheduled to start operation in 2014. PT Supreme Energy, partner of Japan-based Sumitomo Corporation and French international power supplier GDF Suez, has suspended its geothermal power project in Lampung, bowing to local protests, a move that could hurt the campaign to develop alternative energy resources. Supreme Energy chairman Supramu Santosa said on Wednesday that the escalating protest from villagers living on the slopes of Mt. Rajabasa in Lampung prompted the postponement of drilling for the project, which would eventually lead to construction of a power plant with capacity of 2 x 110 MWe. Drilling will be delayed until January next year. The director of American Samoa’s Energy Office says drilling for geothermal energy on the main island of Tutuila will probably start in the middle of next year. Timothy Jones says the drilling is part of a mandate given by the governor to reduce the territory’s dependence on diesel to generate electricity and cut power prices. He says geothermal energy is already successfully used in other parts of the world and can be done in American Samoa. Petratherm of Adelaide in South Australia, has scaled down its flagship hot rocks project in South Australia and given up millions in promised funding in return for fast-tracked funds from the Federal Government's Australian Renewable Energy Agency (ARENA). Australia’s geothermal energy industry is celebrating the new financing arrangement saying it could herald a new era of optimism for the technology, and a more realistic approach to financing and ambitions. The industry has been pleading for a more flexible approach in funding, one that recognizes the large up front (and high risk) costs in drilling programs, and the capital required to build the plants. Under a renegotiated agreement, Petratherm will now receive $13 million under ARENA's Emerging Renewables Program, which will make up half of the $26 million it needs for an initial research project to prove its geothermal technology. Petratherm will use the money to drill a second deep well and complete a deep geothermal reservoir at approximately 3.8 km depth that connects two wells, and will allow geothermal heat to be brought to the surface and used to generate electricity. If this is successful, a 3.5 MWe pilot plant will be built. Renewable energy specialist GCube, which offers comprehensive property and liability coverage for renewable energy projects, has increased its capacity for underwriting biomass and geothermal construction coverage to $250 Million, in response to increasing market demand. The underwriter said that new technologies in the renewable energy sector have encouraged the creation of new biomass and geothermal energy projects. Dominica Prime Minister Roosevelt Skerrit is heading to Paris this week to meet with representatives of the Agence Française de Développement (AFD) for talks on Dominica’s geothermal project. The visit comes about two months after Electricite de France (EDF), announced it would be withdrawing from Dominica’s geothermal project. The company had originally planned to partner with Dominica on the project and export geothermal energy to neighboring Martinique and Guadeloupe, both of which were partners on the enterprise. At the time of the withdrawal, Skerritt vowed to forge ahead with the project. Dominica said AFD had been a “strong supporter” of the government’s efforts to develop geothermal energy. The first radial centrifugal turbine has been installed in a binary geothermal power plant. The turbine was provided by Exergy for the plant operated by Enel Green Power in Bagnore, Mount Amiata, Italy. The plant installed in Bagnore is of a binary type and uses a heat exchanger to transfer heat from the primary fluid (water mixed with steam) that comes out from the well to a secondary organic fluid. This vaporizes and turns the turbine connected to the alternator. The primary fluid is reintroduced into the ground while the cycle ORC itself is closed. Exergy ORC will have a booth at the GEA Expo run in conjunction with the GRC Annual Meeting, Sept. 29-Oct. 2 at the MGM Grand, Las Vegas, Nevada. Mighty River Power Limited is nearing completion of the grassroot, 82 MWe Ngatamariki Geothermal Binary power plant, 17 kilometres northeast of Taupo in New Zealand. Plant commissioning is expected in August 2013. The project is in the final stages of construction, with two of its four generating units already up and running. The total cost of the project is more than $400 million. APC Group, a subsidiary of SM Group's gaming arm Belle, is gearing up to invest $300m to develop a 100 MWe geothermal project in Kalinga province, Philippines. The company has scheduled commencement of the facility for 2018, with plans to raise the power generation capacity to 300 MWe. The geothermal project is being developed in association with Chevron Geothermal Philippines Holdings. APC Group chief Finance officer Bernardo Lim said "By third quarter of 2014, we are going to drill exploration wells. If the exploration wells will prove the existence of a commercial source, we will start the construction of a power plant." The Kenyan Energy Regulatory Commission has published a web-based Portal providing information on the licensing and regulatory requirements for renewable energy projects development in Kenya. The Portal contains information on all the licensing requirements from the different issuing agencies as well as agencies that provide associated information on renewable energy projects and includes prerequisites for application, fees and charges, expected processing time, contact persons and office location, renewable energy electricity tariff structures, status of the renewable energy sector, overview of renewable energy resources, among others. 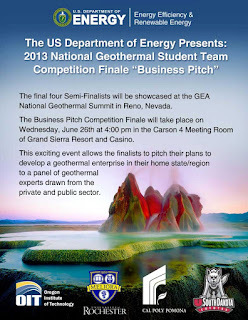 The final four Semi-Finalists will be showcased at the U.S. GEA National Geothermal Summit in Reno, Nevada. TransAlta Corporation announced today that CalEnergy, LLC, a new special purpose entity and Joint Venture with MidAmerican Energy Holdings Company, had executed an 86 MW long-term contract for renewable geothermal power with the City of Riverside, east of Los Angeles. Under the Power Purchase Agreement (PPA), which runs from 2016 to 2039, CalEnergy will provide the power from a portfolio of geothermal generating facilities in California's Imperial Valley. The 24-year PPA builds on an existing relationship with the City of Riverside and represents 25 per cent of the total capacity of the Imperial Valley geothermal facilities. CalEnergy is continuing its work to market the remainder of the capacity from the 10 geothermal facilities as the existing contracts roll off. Dr Juliet Biggs, an award-winning geologist from the School of Earth Sciences at the University of Bristol, U.K., reports from the Alutu Langano Geothermal Plant, where she is working with local Ethiopian experts to track the impact of volcanic unrest across the East African Rift Valley. The Obama administration is considering a sweeping initiative to address climate change, including the first-ever limits on carbon dioxide from power plants, the country's biggest source of greenhouse gas emissions, according to people familiar with the discussions. The White House has yet to settle on specific measures, but "we're hearing that existing power plants are definitely in the mix," said a person with knowledge of the deliberations, who, like others, asked not to be identified to talk about White House discussions. An announcement could come by mid-July. Power plants account for about a third of the country's greenhouse gas emissions, with most of the carbon dioxide coming from coal-fired plants and, to a lesser extent, natural gas generation. Issuing rules to curtail their pollution would almost certainly touch off a battle in the courts and Congress. Taken June 12 on a GRC Field Trip to The Geysers geothermal field. The government of Indonesia has started a fund to finance the exploration of geothermal energy resources as the nation seeks to reduce its dependence on fossil fuels for electricity. The finance ministry’s investment agency will manage Rp 3 trillion ($302 million) this year for geothermal exploration, Saritaon Siregar, the agency’s chairman, said in an interview at a conference in Jakarta on Tuesday. Local governments that have geothermal areas can use the fund to determine their potential, he said. “If exploration shows good results, the local government can put the area for bidding and investors that win can repay the exploration funds to us,” Siregar said. Energy Development Corp. (EDC) on Tuesday said that its shareholders, its joint venture partner and related units have signed on to four projects in Peru and Chile. EDC and its Canada-based partner, as well as their subsidiaries have executed four shareholders’ agreements and other related agreements for the implementation of the terms of a Joint Venture agreement covering the four projects, EDC said in a disclosure to the Philippine Stock Exchange. EDC and Alterra Power Corp. of Canada will jointly undertake the Tutupaca Norte, Loriscota, and Crucero geothermal projects in Peru. The companies will also tend to the Mariposa geothermal project in Chile. Aboitiz Power Corp has begun pre-development work on a geothermal prospect that straddles the provinces of Zambales and Pampanga. Ria Calleja, Aboitiz Power assistant vice president, told reporters over the weekend that subsidiary AP Renewables Corp has started initial work on the Negron-Cuadrado geothermal prospect. The company, however, has yet to identify the potential power generating capacity and the needed investment to develop the project. "We were awarded the geothermal renewable energy service contract for the Negron Cuadrado service area by the [Department of Energy]," Calleja said. AP Renewables control the Aboitiz Group's lone geothermal asset -- the 289-MWe Tiwi and 458 MWe MakBan geothermal power complex -- located in Albay, Laguna and Batangas. The Salton Sea has long been known as a scenic wonder and one of the most important wetlands for migratory birds along the Pacific Flyway. But in recent years, the sea has also earned a reputation as California’s crown jewel of renewable energy resources, given its known geothermal reserves and its ideal conditions for both solar and biofuel production. In fact, a commissioned study by the Salton Sea Authority found that the Salton Sea area could produce enough renewable energy to power 6.5 million homes, generating over $5.3 billion annually for the local economy. The geothermal facilities around the Salton Sea will be a feature of a GRC Field Trip after the GRC Annual Meeting & GEA Expo in Las Vegas, Sept. 29-Oct. 3. Bali has rejected the central government`s plan to build a geothermal power plant in Bedugul, Tabanan, due to a religious reason. The governor said the main reason for his decision is that because mountains, forests, beaches, lakes and estuaries are holy areas. The ministry of energy and mineral resources has planned to build the plant and is awaiting for the governor`s approval. "We will start it as soon as the governor agrees," energy minister Jero Wacik said after speaking at a meeting with Hindu leaders here on Friday (June 14). Wacik said if the project is finished Bali will have an additional electricity supply of 150 to 200 MWe. Bali, which is the country`s most popular tourist destinations, at present needs around 600 MWe and in the future the province would need up to 1,000 MWe. Various parties have expressed their rejection to the project located in the Batukaru wildlife preserve in the districts of Tabanan and Buleleng for fear it would cause environmental damages. The Hindu Dharma Council of Indonesia (PHDI) has also asked the government not to go ahead with the plan saying that "mountains and forests are considered holy sites by Hindus". Montserrat is close to completing the second well of its geothermal drilling project, the government said. The first well is being prepared to testing, while the second well has been drilled down to 1,184 meters. It is currently being lined with steel casement pipes, with cementing already having begun. “We anticipate that over the next three weeks drilling will be completed and we will continue monitoring the warm-up and making preparations to test both wells,” the government said in a release. The territory began the geothermal drilling in March, with Iceland Drilling Company performing the drilling work. June 10-13, 2013, Embassy Suites Sacramento Riverfront - Sacramento, California and Calpine facilities at The Geysers geothermal field in northern California. hot water. Could it be used to heat homes? Like most cities in Europe, Glasgow has a rich past. It was a small merchant town before the industrial revolution, and now, with 600,000 people, it’s the largest city in Scotland. We wanted to visit Glasgow for a unique idea that the Scottish government is developing to meet some ambitious energy goals. By 2015, the country wants half its energy to come from renewable sources. Five years after that, the goal is 100 percent. Part of the answer may be under the streets, down in caverns more than 200 years old that were excavated for coal. As coal mining became too expensive in Glasgow in the 20th century, the mines were abandoned. The pumps that kept water from trickling in were shut off, leaving the tunnels to flood. Now, below the feet of Glaswegians, there’s are more than a million gallons of water sitting in the caverns, heated by the Earth. No matter how cold it gets in chilly Glasgow during the winter, the water still stays fairly warm by comparison, about 51 degrees F (11 degrees C) near the surface. The deeper you go, the warmer it gets. The Crown has apologized for failing to live up to its Treaty obligations to the Rotorua iwi Ngati Rangiteaorere. Today the tribe signed its Deed of Settlement with the Government. In the agreement the Crown acknowledges that descendants consider the Tikitere (or Hells's Gate) geothermal resource to be a taonga, or treasure, and was used for medicinal, spiritual and bathing purposes. In 1953 the Crown grabbed the rights to the geothermal resource, without the tribe's consent, but the geothermal field will not be handed back. Ngati Rangiteaorere is to receive $750,000 in financial redress. That sum's in addition to a previous payment of the same amount of money, and the return of Te Ngae Mission Farm in 1993 - which was a partial settlement. The Crown has issued an unreserved apology for undermining the mana and rangatiratanga of the iwi. On Tuesday Governor Sandoval signed into law Senate Bill 123 that requires Nevada utility NV Energy to get rid of 800 MW of coal-generated electric power by the end of 2019 and replace it with 350 MW of renewable energy and 550 MW of power from sources other than coal. The company has announced its intentions to close the Reid Gardner coal-fired plant (PDF) near the Moapa Indian Reservation. Critics contended the bill took some regulatory control away from the Public Utilities Commission and might lead to higher rates. But the new law specifies the utilities commission can make modifications to NV Energy plans that the utility must accept or else withdraw its plans. According to their website NV Energy signed their first geothermal energy agreement in 1983, and their customers are now benefiting from more than 385 MW of installed geothermal energy capacity in Nevada. NV Energy has new contracts for more than 150 MW of additional geothermal energy, which is in the construction or development stage. Governor Sandoval and Michael Yackira, CEO NV Energy have been invited to speak at the Opening Session of the GRC Annual Meeting, Sept. 29-Oct. 2 at the MGM Grand, Las Vegas. Rebecca Wagner, Commissioner, Nevada PUC has accepted the invitation. Current MGM Grand Discount Room Rates End July 31, 2013 - Book Your Room At The MGM Grand Now! This report (PDF) presents an analysis of a database of global geothermal drilling success. The database, compiled by the International Finance Corporation (IFC), covers geothermal fields that together supply power to 71 percent of the world’s installed geothermal electricity generating capacity, making it the largest database of its kind. This report analyzes that data to gain a better understanding of the probability of drilling a successful well, and the factors that influence such success, which will be of interest to geothermal developers, and to financiers engaged in the risk assessment of such projects. Filipinos need not travel to far Iceland to have the world-famous "Blue Lagoon" spa experience as a renewable company energy finalizes plans to put up a hot spring and wellness center near a geothermal power plant in scenic Lake Naujan in Oriental Mindoro. "Filipinos will experience up close the benefits of geothermal power and the soothing balm of a refreshing health bath in our hot spring near our geothermal power plant. We are going to bring the Blue Lagoon experience here," said Antonie de Wilde. The debate about Hellisheiðarvirkjun power plant not being able to harness sufficient geothermal energy to meet demands is part of the fight against aluminum smelters in Iceland, according to former CEO of Reykjavík Energy (OR) Guðmundur Þóroddsson. “To me it sounds like a political plot in the fight against building more aluminum smelters in Iceland. It reeks of people trying to kill or delay the Hverahlíð power plant. It’s part of the global fight against international corporations, which I find taints all environmental debates in Iceland,” commented Guðmundur to Fréttablaðið. According to Guðmundur, at least nine to ten holes can be drilled in the area around Hellisheiðarvirkjun which would suffice to maintain full capacity given the current 2.3 percent annual decline of six MWe. The Nova Scotia town of Springhill has been given permission to use underground water as an energy source in what the provincial government says is the first municipal geothermal program in the province. The government says Springhill can tap into water sources at old mining sites in the area. The water would be pumped to the surface and its heat extracted for energy. Mayor Maxwell Snow says the mine water offers a renewable and sustainable energy source for the town, and a way to move away from a reliance on coal. Indonesia can produce 29 GW of power from the 299 geothermal energy locations across the country but currently, only 15 of them are able to produce 1.341 MW of power, says a local geologist. “Of the 15 exploration sites, only eight are in production,” said Yogyakarta’s Gadjah Mada University (UGM) Geological Agency head, R. Sukhyar, during a geothermal development campaign at UGM’s Engineering School. Ten of them, he went on, were being exploited by state oil and gas company PT Pertamina, while five others were controlled by a joint venture between Pertamina and foreign companies. “However, there are many obstacles, so the development of geothermal energy is taking place very slowly,” Sukhyar said. Imperial County to use grant to amend the geothermal/alternative energy element of the county's general plan. The California Energy Commission has awarded $3,341,152 in renewable energy planning grants to five counties including Imperial County which has important geothermal resources. The funding will help the county with its collaboration and coordination with the Desert Renewable Energy Conservation Plan (DRECP) while also addressing renewable energy and conservation goals within its planning processes. Imperial County will use $700,000 to update and amend the geothermal/alternative energy element of the county's general plan. The project calls for revising ordinances, maps and other required environmental documents involved. The geothermal facilities of the Imperial Valley will be a feature of a GRC Field Trip after the GRC Annual Meeting & GEA Expo in Las Vegas, Sept. 29-Oct. 3. The Indonesian government will raise the price of electricity produced by geothermal power plants to promote business certainty, and resolve a number of geothermal projects that have stalled due to financial problems, Energy and Mineral Resources Minister Jero Wacik said on Wednesday. The minister said that with the revised pricing plan, investors involved in the operation of geothermal power plants would be given more certainty in running their businesses. “The prices will be determined through a tender. Those with the lowest bid will win the geothermal projects being auctioned,” Jero said during the opening of the first Indonesia International Geothermal Convention and Exhibition. Separately, the ministry’s director general for renewable energy and energy conservation Rida Mulyana said that the decree on the new pricing, which would be based on power plant capacity, as well as based on enthalpy, or heat content, would be issued next week. There will be five groups based on power plant potency, namely over 55 MWe, 20 -55 MWe, 10-20 MWe, 5-10 MWe, and under 5 MWe.